WHAT’S THE DIFFERENCE BETWEEN CORE10 AND TRADITIONAL PILATES CLASSES? CORE10 is a high-intensity, low-impact workout that gives faster results than traditional Pilates. Strengthen, lengthen and tone like no other workout! Core10 Takes The Complication Out Of The Workout making every class more athletic and doable for all levels, no matter your experience. Essentials is a slower-paced class with more detailed instruction and are perfect for new people and anyone who prefers this pace regularly. Our signature Full Body classes are designed for all levels. Cues are given to make it more or less challenging. High-Intensity. One of the main advantages of Core10 is the intensity of the workout. Expect to burn 300-500 calories per workout. 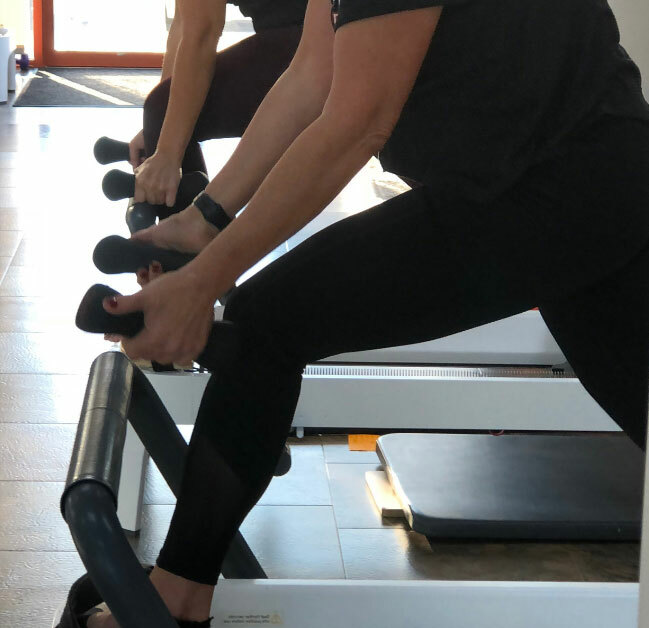 Classes are designed to get your heart pumping in a way that traditional Pilates can’t, increasing your metabolism for hours after the workout to burn even more fat. Wider Range Of Motion. Core10‘s Allegro 2 machines are longer and wider than traditional reformers so they better fit taller people. They’re also highly adjustable, allowing us to perform a lot more exercises than you can on traditional reformers. We use the springs from the front and the back of the reformer, as well as incorporating springs from the attached tower unit. Traditional Pilates is most often done lying down and sitting on a smaller traditional reformer, primarily working with the springs in one direction, which limits the number of muscle groups you can target. Sweat – Shake – Burn is our motto for a reason! We sequentially work our muscles to muscle fatigue for maximum strength gains, as you would in traditional strength training. Every move incorporates multiple muscle groups, which not only makes your heart pump but also makes you shake as we progressively work the entire body through the 50-minute workouts. We recommend that people try Core10, even if they have no experience with Pilates. The sheer variety of moves means that there’s something for everyone here, from complete beginners to seasoned athletes. HOW DO I SCHEDULE PRIVATE PILATES SESSIONS? If you have chronic pain, a severe medical condition, or recovering from an injury, you must have your doctor’s clearance to begin any new physical activity, such as Core10 Pilates sessions. Core10 group classes are not designed to be post-rehab, and not everyone is physically able to join classes, especially if you’re in chronic pain or have a severe medical condition. You may need to take private sessions until we approve you to join group classes. HOW OFTEN SHOULD I DO THE CORE10 WORKOUT? Some people come as little as 2 times a week and get good results. Most come 3-4 times a week because they prefer the faster, more dramatic results you’ll get from that consistency. There a quite a few members who are addicted to the results of their Core10 workouts so much that they take 4-5 classes a week – but you always need at least 1-2 recovery days a week for best results. WHAT IS YOUR LATE CANCELATION POLICY? We have a 12-hour cancellation policy. There are no exceptions. If you have to cancel inside of the 12-hour window, you’ll forfeit the class. Members with unlimited memberships will incur an additional charge of $15 for a late cancellation and $20 for a no-show. All cancellations must be made online through the Mindbody app or through your account on our Class Schedule webpage. Email and text cancellations are not accepted. I’M NEW – HOW EARLY SHOULD I ARRIVE FOR MY FIRST CLASS? If you are a new client, plan to arrive 10 minutes early to get set up on your reformer. Failure to arrive early may result in your not being permitted to take your scheduled class. This policy is to ensure your safety and enjoyment. If you’re running late to your first class…To ensure the safety of our clients, if you are new to CORE10 you need to arrive 10 minutes prior to class time, as late entry will not be permitted. We require that all new clients receive a proper introduction to the instructor and equipment. Thank you in advance for understanding and making it a priority to be 10 minutes early. I’M RUNNING LATE — WILL I LOSE MY SPOT? It is recommended that you arrive at least 5 minutes before the start of class. However, we understand that life happens! In the case that you arrive more than 5 minutes late for class, your spot may be given to a standby client. If you arrive more than 15 minutes after start time, you will not be allowed entry for your safety and the experience of all clients. If you arrive late, and we have already given your spot away, you will not be charged for the class. Click the word “Waitlist” and add yourself. You’ll get an email notification that you’ve been moved from the waitlist to the class. Once you’ve been moved from the waitlist to the class, you own that spot and the 12-hour cancellation policy now applies to you for that class. Waitlists are active outside the 12-hour window. If you don’t get into a class you wanted, check the schedule within the 12-hour window for any late openings – it will say “Book” if there is an opening. You may need to remove yourself from the waitlist first prior to adding yourself to class while inside the 12-hour window. You are responsible for taking yourself off any waitlists and/or other classes that were booked. Failure to remove yourself from classes results in being charged for both classes as if you attended, no-showed or late canceled. WHAT SHOULD I BRING (AND NOT BRING) TO A CORE10 SESSION? For safety and sanitary reasons, we require that clients wear grip-socks. These are available for purchase at the studios. Shoes and bare feet are not permitted on the machines. Bring a hand towel as you will most likely sweat. We have water available for purchase, but you are welcome to bring your own water bottle and fill up with our filtered, cold water that is provided in the studio. Jewelry is NOT a good idea. Necklaces, in particular, can get caught and break. No strong perfumes or body products in the studio. Please be courteous to classmates who may have allergies. We have cubbies (visible in the studio) for your personal belongings, however, it’s a good idea to leave valuables at home. Out of courtesy to your trainer and classmates, cell phones need to be on silent/vibrate only. If you absolutely must be on-call during your Pilates workout, you will be expected to take your phone call outside for any conversations. CAN I TAKE CORE10 CLASSES IF I’M PREGNANT? If you were regularly taking Core10 before you got pregnant, you can continue to take classes as long as you feel comfortable and have your doctor’s approval. All of our instructors are trained in pre and postnatal modifications. If you are new to Core10, we do not advise you to try it for the first time when pregnant. Doctors don’t recommend taking a new workout when pregnant, especially something as core-intensive as Core10. Thanks to our local media weather coverage, we all know when there is a big storm coming. If you reserve a spot, be sure that you can make it. If you’re not sure, wait to check the schedule closer to class time and add yourself later (in to avoid late cancellation charges). Even during storms, we rely on our online reservation system to manage our schedule in advance. Should a storm prevent trainers from getting to CORE10 studio, or a tornado warning is in effect (this does not apply if it’s a “tornado watch”), we will cancel a class and notify anyone scheduled. When in doubt, check the online schedule and your email for any class change notifications.